That is not because active members of the U.S. military are shirking their duty. 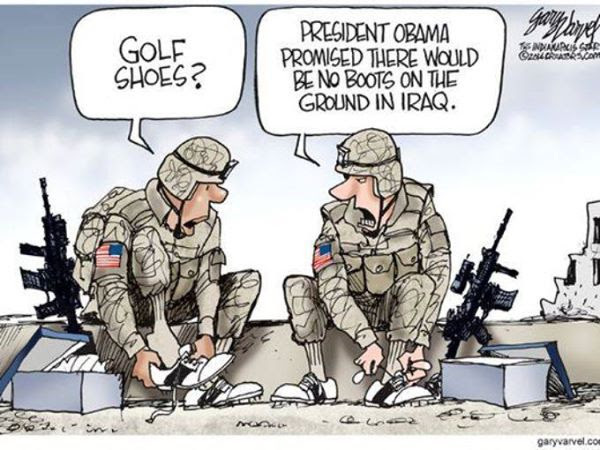 Rather, their opposition to “boots on the ground” in Iraq is due to their doubts about their commander in chief, President Barack Obama. Andrew Tilghman, et al., report for Military Times, Sept. 29, 2014, that as the tide of war rises again in the Middle East, the military’s rank and file are mostly opposed to expanding the new mission in Iraq and Syria to include sending a large number of U.S. ground troops into combat, according to a Military Times survey of active-duty members. The survey was conducted online this summer and concluded in August just as President Obama was ramping up the air campaign against the Islamic State group. On the surface, troops appear to support Obama’s repeated vows not to let the U.S. military get “dragged into another ground war” in Iraq. Yet at the same time, the views of many service members are shaped by a deep ambivalence about this commander in chief and questions about his ability to lead the nation through a major war, according to the survey and interviews. “It’s their country, it’s their business. I don’t think major ‘boots on the ground’ is the right answer,” said one Army infantry officer and prior-enlisted soldier who deployed to Iraq three times. He responded to the survey and an interview request but, like several other service members in this story, asked not to be named because he is not authorized to discuss high-level military policy. As the U.S. expands that air war into Syria and increases the number of U.S. boots on the ground in Iraq — topping more than 1,700 total — service members say their feelings about the crisis and the U.S. response to it have intensified. In barracks and staff offices, on smoke breaks and over after-hours beers, troops’ conversations about Iraq have shifted abruptly from reflections on the past to questions about the future that are fraught with concerns about the wisdom and scope of new missions. Troops are raising new questions about why the U.S. withdrew from Iraq in 2011, what went wrong and why. Many simply wonder why anyone should think the long-term outcome will be any different this time. “It’s kind of futile in the end — regardless of how well we do our job, the Iraqi government isn’t going to be able to hold up,” Marine 2nd Lt. Christopher Fox said. And many share the views of one Navy hospital corpsman second class at Camp Pendleton, California, who said his multiple deployments to Iraq and Afghanistan have taken a toll on him mentally, physically and personally. “We’re burned out,” he said. Some troops think the U.S. should simply stay out of the conflagration engulfing the Middle East. 2. Troops intuitively understand that final decisions ultimately land on Obama’s desk. And support for Obama within the military — never especially high — has dropped significantly since he took office, according to the Military Times survey — from 35% of service members in 2009 who approved of the way Obama was “handling of his job as commander in chief,” to below 15% this year. This entry was posted in Iraq, ISIS, Islam, Islamic State/ISIL, Syria, United States and tagged Capt. Eric Hatch, Gen. Martin Dempsey, Lt. Christopher Fox, Marine Gen. John Kelly, military mistrust for Obama, Peter Weaver, Rally Point, Sgt. Darrell Priestley, Yinon Weiss. Bookmark the permalink. The Secret Service, an elite corps of men and women sworn to take a bullet for the president, is in disarray. Reportedly, the Department of Homeland Security, too, is in disarray. The latest is a survey of active military service members which found that a majority (more than 70%) oppose combat “boots on the ground” in Iraq, not because they don’t want to fight, but because they have grave doubts about their commander in chief. All signs of an administration that is falling apart at the seams. I don’t think that putting US or NATO ground combat forces on the ground in Iraq or Syria is a practical thing to do. They would be denounced as “occupiers” and would find it difficult to operate in the rural areas where most of the fighting will take place. Ground combat forces should be from Moslem countries, preferably Arabs and Kurds. I don’t think Turkish ground forces would be useful either – to much animosity based on previous Turkish occupation of the area. We can, and should, however, provide air support, logistics and advisors to the ground troops engaged. Yes, this means having people wearing boots on the ground. But those people will not killing Arabs at close range or attacking villages on the ground. They will be armed, of course, and will defend themselves if attacked. But a 6-man Special Ops team on a hilltop directing air/artillery support is not the same thing as an infantry platoon raiding village. As far as confidence in Obama goes, NOBODY trusts him to keep his word or to lead effectively. His convictions are deeply held – until the next poll comes out. And he does not motivate troops the way GWB did. The troops know Obama and that he is not on their side. Thank you StMA for this most significant post. According to the evidence, the members in our military do not trust the “king”. What a position to be in – terrible! If you want to understand how he troops feel about Obama as compared to GW Bush, just look at video clips showing the in the presence of the troops. Obama, dressed in a tailored suit, enters the room with an entourage which insulates him from direct contact. He mounts a platform in front of a bunch of selected people who would obviously rather be somewhere else. Then he delivers a canned lecture, receives polite applause from the troops who know their bosses are watching their reaction. Then he gets off the stage and out of the building s soon as possible. Bush, on the other hand, would arrive in casual clothing (or a flight suit), mingle with the troops, chatting and posing for pictures. He obviously enjoyed being with the troops and they enjoyed being with him. The picture of him carrying a turkey into the mess hall in Iraq was a stroke of genius. It told the troops, “This guy actually likes us.” It showed in his face and attitude and in the attitude of the troops who clustered around him. Even now, when GWB is retired and will never run for office again, he spends a great deal of time working with wounded warriors, while Obama works to cut pensions and benefits for current, retired and disabled military people. The troops know who is on their side and who isn’t.